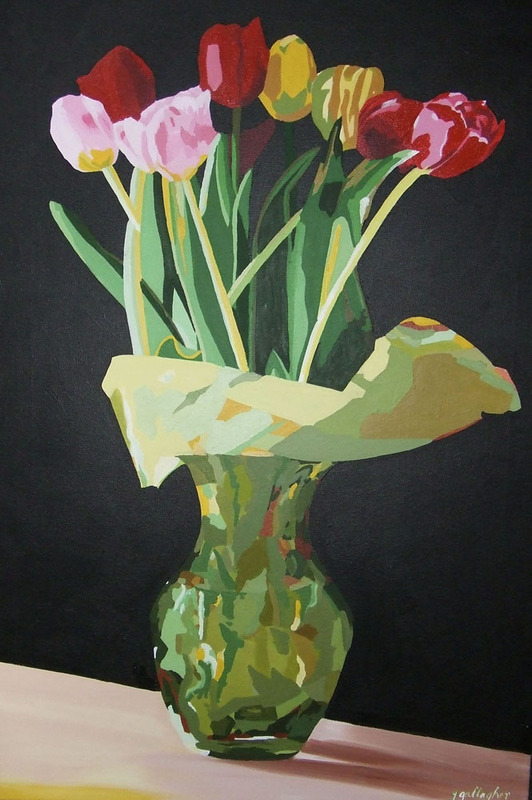 I love tulips, they are so graceful and full of personality. This year on my birthday my sister-in-law sent me a beautiful arrangement. I immediately began photographing them. Next I played around with them on the computer and came up with exactly what I wanted to paint. I named it the gift, it is one I will truly cherish forever. The wind gave her folds and wrinkles, but she never complained. She did not fight back. All she did was wait for the right time, for that subtle breeze that would lift her up. And there she was, dancing to nature’s beat, floating like a cloud. Fragile turned graceful, docile turned unbowed. She took it all in, both good and bad. Because she always knew true beauty needs time. This painting has two subjects. The poppy itself is very beautiful on its own, but it is the breeze that gives it its character. 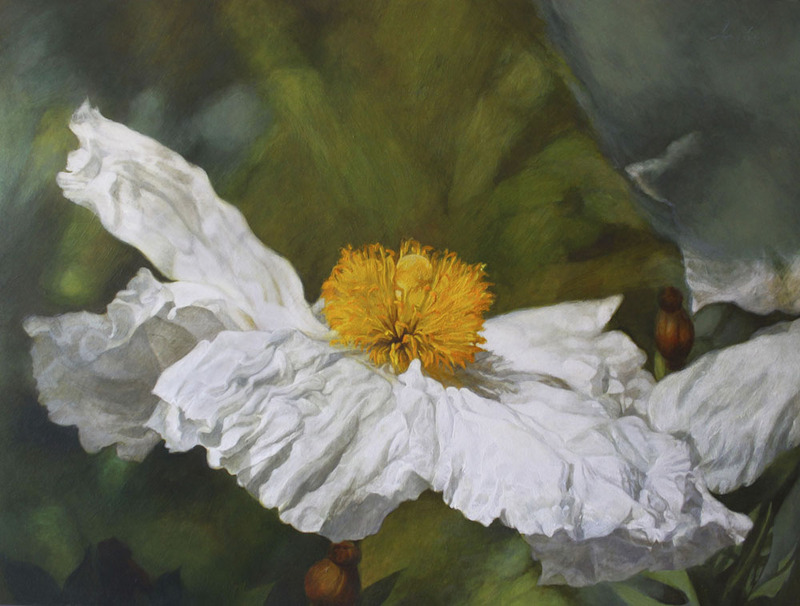 Watching this flower at its peak is definitely something worth painting and sharing. Last summer I went to paint “sur le motif” (on the spot) the marvelous pond, covered with water lilies, at the Montreal Botanical Garden. 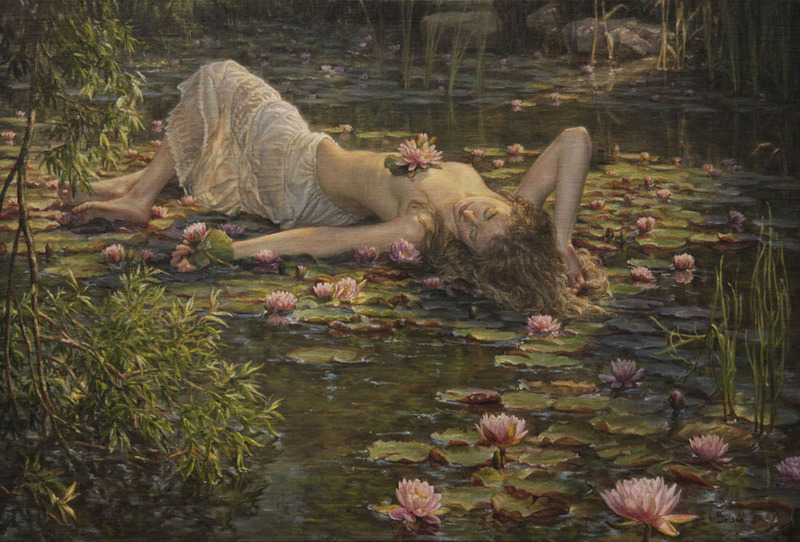 At one point, my husband, also a fine art painter, exclaimed, “It is like a true bed of water lilies.” His simple comment combined with my interest in painting the pond, gave birth in my mind to this picture of a young woman, half-naked, lying on a bed of water lilies, personifying the bursting vitality of the pond that I was witnessing. The saguaros growing near our home in Scottsdale, Arizona, are my favorite plants. 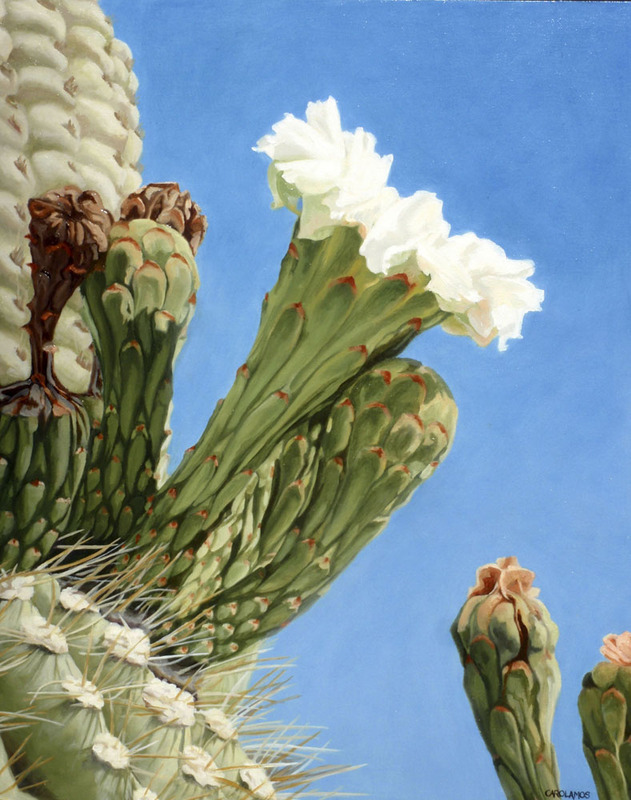 Their impressive size, sculptural shape, and ability to thrive in the harsh desert are fascinating to me, but in May and June when they erupt with extravagant bouquets of white flowers amid the spines, and in July when their bright red fruits open to attract and feed the birds, I find them completely irresistible! On my morning walks I enjoy taking time to examine the plants and their flowers and fruits from every angle. This painting is intended to show that the flowers are not only spectacular when seen from the front, but are equally interesting and beautiful when viewed from the side, along with the buds, the spent flowers, and the fruits starting to form. 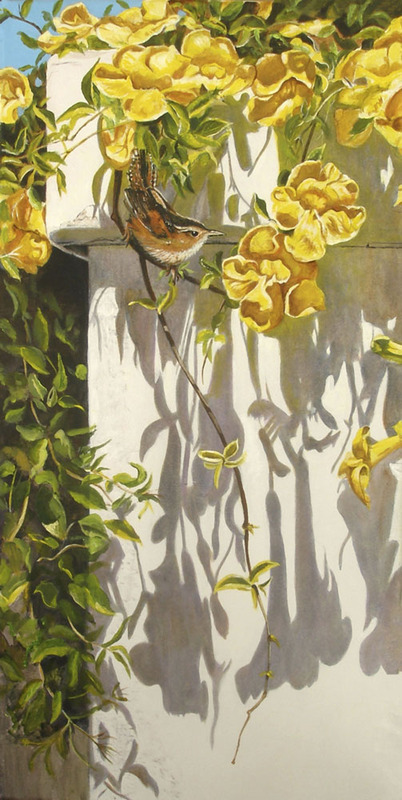 I have a beautiful garden where I often see birds on my water fountain or hopping along the garden wall. One day the lighting was gloriously perfect, presenting cast shadows of the cat’s claw vine as it tumbled over the crest of a pilaster. Little house wrens are frequent visitors, and I enjoy nothing more than depicting their polite and delicate presence as they enjoy the garden. To capture and still the fleeting moment of this communing of nature is very satisfying.